I forgot to show you this one before. 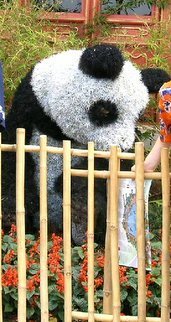 I was blown away by this panda topiary. Believe it or not, it is all live material. The white part is some sort of succulent. I don't know what the black part is; there was no one around I could ask. It is too bad I couldn't get a better shot of it. Wow...that's amazing! It looks SO real! Some very clever people around. Actually, I love most animals. Just a sucker I guess. Wow, that is amazing. I'll have to keep an eye out for it next time we're there.